Aundrey Walker took over as USC’s left tackle only a few practices into Spring Ball and hasn’t looked back. He is the only new starter on USC’s offensive line, and must replace Matt Kalil while protecting Matt Barkley’s blind side. Tom: First of all Aundrey, thank you for your time, I really appreciate the chance to talk with you more in depth and I know you’re busy. Tom: What was it like playing on USC last year? Aundrey: I mean it was different from High School. I feel like camp here made you a man, and made you actually realize “did you want to play this game, do you want to play this sport” and at USC the team, the coaches, it’s a lot of love. I had a great time last season and I’m really looking forward to this season. 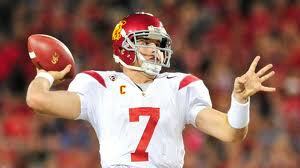 Tom: What ultimately made you decide to go and stay at USC despite the sanctions? Aundrey: It was just my dream, it was my dream school and when I got the offer I was lost for words because it was just three years ago I was watching them on TV and now I had a chance to be a USC player so I thought why not take it. It wasn’t just looking at the football side, it was academics too. You can do a lot of things with a USC degree so I knew it was a good route to take. Tom: What was the team’s mindset like given the 2nd and last year of the bowl ban? Aundrey: The mindset was just go out there and have fun. I mean, we really didn’t worry about the bowl sanctions to be honest. It was more about establishing team unity and becoming more of a family. We just went out there and played, went out there and played as a team. Tom: Is the team excited to finally have a chance at a BCS bowl game again? Aundrey: Oh of course. It’s always been a dream for a high school kid to come to college and play in a bowl game. I’m happy that we have the opportunity to compete for a bowl and we are all looking forward to it. Tom: What was your playing weight during the season last year? Aundrey: Last year in January I was 378 on my visit here at USC and I went back home and my Uncle was told me “you can’t go to college at that weight” and I came to USC at 352. But through all that I was gaining weight as I was at USC. Mini-camp came around and I got down to 346, then I went home in December at 344 or 342 and came back 330. I just kept going through the training and weight lifting with the whole training staff and I lost 30 more pounds to get down to 296. That was my last time I weighed in at 296. It really only took me four months to lose all that weight. Tom: That is amazing Aundrey. You should be really proud of that. Obviously you changed your eating habits, but what kind of weight training did you do to help you lose so much weight? Aundrey: It was a lot of conditioning, a lot of running, a lot of cardio. And when we lift weights it will be low weight but heavy reps so you burn more fat. Tom: Do you feel faster now that you are under 300 pounds? Aundrey: Oh yeah of course, I feel like a gazelle out there. Tom: What has playing lighter changed most about your game? Aundrey: I’m more explosive and quicker off the ball and I feel like I can compete. When I played at 346 I was very sluggish and I lost my breath a lot. Within five plays I would lose my breath, but now I can play forever I feel like. Tom: I remember reading that you said you were “surprised” that you were named the left tackle over Kevin Graf, did you expect to be at right tackle this year? Aundrey: It was really just, whatever my team needed me to do I was going to do it. That was my mindset. If I was right tackle, right guard, left tackle, center it doesn’t matter. I was just out there working and they switched me over and if I got the opportunity to play left tackle why not take it. I worked hard and I’m still working hard to maintain this spot. Tom: I read that Graf started out the spring at left tackle, but shortly after you were at left tackle the rest of the way. Is that true? Tom: What was your reaction when the team moved you to the left side? Aundrey: Did you say what was the team’s reaction? Tom: No what was your reaction, but yeah both! Aundrey: I mean the team was happy with it, it was a coaching decision and they felt comfortable with me playing there. 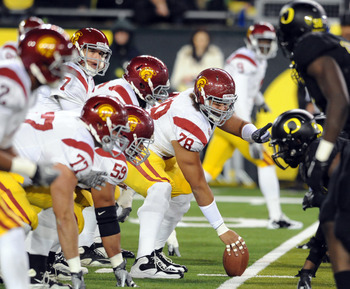 I have to go out there and play hard every play to help keep Matt Barkley protected. But I was happy obviously, a very good feeling. Tom: Did your offensive line coach mention anything to you about things you were doing well during spring ball? Aundrey: I don’t ask him much about that, I’m more of a guy who likes to work on my game and work on the flaws of it so he’s going to send me a cut-up of things where I need to improve. We’re more focused on those things. Tom: What are some of the things you think you need to work on? Aundrey: I would say my point of contact, I think I open up a bit too much in pass pro just being honest with myself, I think I need to work on that. If I stop opening up so quick I think I can be a great pass protector. Tom: I know you said you like to focus on where you need to improve, but if you had to pick one of your greatest strengths as an offensive tackle what would it be? Aundrey: I like to pull and to get out in space and POUND dudes. Tom: Did you pick anything up from Matt Kalil while you were at USC with him? Aundrey: Oh yeah I picked up a lot from him! The reason I was so determined was because of him. He told me that I have to grind. He told me the left tackle spot was open and I had to go out and take it. I promised him I would come back at 320 pounds and I did. So I mean I always looked at him and his pass protecting, he was a great pass protector, a great run blocker. He was just an all around great player and athlete. Tom: Would you say he’s one of your mentors for the position? Aundrey: Oh of course, of course. Tom: Do you have any other mentors? Aundrey: I work with LeCharles Bentley, he helps me a lot. Tom: Did you ever get to go up against Nick Perry in practice? Aundrey: I think it happened one time. It was a lot to handle it really was, knowing that he was a big NFL prospect. Tom: Did you stop him or did he get you? Aundrey: Umm… It was at the point of contact and I couldn’t really move him he’s just a brick. Aundrey: Everybody who is on defense right now is stickin’ out. Tom: Give me one player who really balled out on defense. Aundrey: TJ. But that’s normal for TJ, he’s a great player. On the whole we have a great defense. Dion [Bailey], Hayes [Pullard], Lamar [Holmes], Wes Horton, Nickell Robey. Aundrey: Same. All around we are a great team I feel like. Offense we have targets, defense we have talent. I can speak for everybody. Our whole offensive line, quarterback, running back, receivers, tight end, everybody is talented. Tom: Do you feel any added pressure being the only new starter on the offensive line? Aundrey: No, not at all. Tom: I mentioned earlier that you’ve got a little nastiness to you, is there anyone else on the offensive line like that? Aundrey: Khaled Holmes. He’s a great guy, a great role model. He’s very smart, very intelligent. He knows everything. The whole playbook, he’s like another coach away from the coaches. Tom: That’s great to hear. I like John Martinez too, what’s the story on him? Aundrey: Oh, John Martinez? Oh my god he’s an animal. Just one word: animal. That defines John Martinez. Tom: I really like that he can play center and guard, I like that versatility. Aundrey: Oh yeah absolutely. I mean he came in as the #1 recruit as a center right? Tom: I think so. Oh, and tell me he still has the afro from last year. Aundrey: Oh yeah he has braids now though. Tom: Do you have any specific goals for the upcoming season, both for the team and for yourself? Aundrey: Just go out there and play, just have fun. That’s all it is, go out there and try to win every game, step by step, day by day. Tom: Is there one game this year you are particularly looking forward to? Aundrey: All games. All games are important and we just have to go game by game. There’s not one particular game I’m focused on because we need to win every game. Tom: Is there a defensive lineman you are particularly excited to go up against? Aundrey: I haven’t heard anything yet, probably during mini-camp and before the season I’ll hear something but no I’m not worried about anyone really. Aundrey: I’m a great guy, I love to sing, and I’m determined and dedicated to be successful and failure is not an option. Tom: Wow, that’s probably the best answer I’ve ever heard for that question. What’s your favorite song to sing? Aundrey: My favorite thing to sing? Another Day, Another Dollar hahaha. Tom: Haha! Good answer! My favorite thing to sing is any Eminem song. Tom: Well that’s about all I’ve got, do you have any questions for me? Aundrey: No not at all, thank you so much. Tom: Great, well thank you for taking the time to talk with me and I am looking forward to watching you this season! I’m sure we’ll talk before the season, good luck with the rest of your training. When does summer camp start for you? Aundrey: August 7th I believe. Tom: Alright, well congratulations on all your progress, and I’ll be in touch! I’ll send you the link when I get the interview up on the site. Thanks again Aundrey. McNeal emerged and was the unsung hero of USC’s dominant offensive attack over the last half of the season. This year he is the incumbent starter and figures to turn even more heads in 2012. Size: McNeal is listed at 5’7”, 182 pounds and while he might look like an undersized back, and to an extent he is, he has the leg strength to gain tough yards after contact and he does a good job of keeping his pads low and really packs a punch when he initiates contact because of his low pad level. His size isn’t elite by any means, and it may keep him from being a true feature back, but if he can get up to 190 pounds without losing speed I think he could be a very effective NFL back. Speed: McNeal has very impressive speed. I think he might be a 4.45 guy or faster, which is impressive and necessary to compensate for his lack of size. He has the speed to consistently get the edge, though USC rarely tested that speed and usually ran him between the tackles. He did show the ability to bounce runs outside and get the corner, and he has the straight-line speed to break off big play touchdown runs. His speed is definitely one of his strongest assets. Quickness: McNeal also has impressive quickness, especially when making cuts and changing direction. It makes him difficult to tackle for a loss, it makes him a significant threat in the open field, and it helps him hit the hole quickly once it forms. His quickness is impressive, and it makes him a potentially very good fit in a “one cut and run” system that many teams incorporate. Running Inside: McNeal spent much more time running inside than you might think for a back his size. After Marc Tyler was injured and struggled to be effective USC began to rely on McNeal more and more as the season went on, essentially replacing Tyler with McNeal in his exact role. The difference was, McNeal could get to holes faster than Tyler did, got through them faster than Tyler did, and got chunks of yardage as well as some very big touchdown runs that Tyler couldn’t have made. Tyler was relegated to more of a power-back, short-yardage role because of McNeal’s effectiveness and that had a lot to do with McNeal’s ability to find cut-back lanes inside, set up his blocks patiently, and hit holes once they presented themselves. McNeal was running similar plays to what Tyler was, he was just producing more significant yardage when given those carries. McNeal’s size may make people doubt that he can run inside, but there were only two instances where I didn’t see him fall forward for additional yardage at the end of tough runs. On top of that, he has impressive leg drive that helps him gain tough yardage after initial contact, and regularly gained additional yardage after a defender got his hands on him. His quickness and his leg strength helps him run through arm tackles, but he has also shown the ability to take huge hits and maintain his balance which is very impressive. When he can plant and go he really picks up a head of steam and actually injured a player or two trying to tackle him heads up because he generates such significant pop on contact due to his leg strength, speed and low pad level. McNeal is an effective inside runner, and that should open up the possibility of being the #2 back in a balanced backfield in the NFL, if not being a feature back. Running Outside: McNeal has the ability to do this, as his patient running style allows his blocks to set and his ability to plant, make one cut and go means defenses can’t overpursue or he will find a cut-back lane and make them pay. It will be interesting to see if USC runs more power, off tackle and toss plays next year, because when they did run power and off-tackle plays McNeal was very successful because of his speed (though, on a couple of his big runs, Matt Kalil essentially blocked two people and sealed off a 3rd when they ran off tackle). McNeal is an effective outside runner but also effective at finding cut-back lanes, so as he gets more carries as a senior he should prove to be an effective outside runner. Receiving: McNeal hasn’t been used often as a receiver, but I didn’t see him drop a pass in any of the games I watched even as he became an ever more integral cog in the USC offensive attack. He catches the ball with his hands effectively, looks the ball in, and is obviously dangerous after the catch because of his speed, quickness and ability to use his blocks effectively. I don’t think he will ever be split out a lot and probably won’t run a lot of intermediate/deep routes, but he is reliable catching the ball out of the backfield on short passes at least. Blocking: McNeal’s size is a hindrance to him as a blocker, but he did a surprisingly good job at it considering his limited playing experience at that point. I think his ability to pass block made it easier and easier for Lane Kiffin to trust him as the feature back as the season went on, and likely played as much of a role in him getting the majority of the carries as his ability to gain quality yards running and catching the ball out of the backfield. McNeal isn’t an elite pass blocker, and he probably never will be because of his size, but he consistently made the right blitz pick-up, squared him up and popped him. He doesn’t do a very good job of sustaining since almost all of the defenders he is picking up in pass protection are bigger and sometimes stronger than him, but he slows them up before he releases to the flat or cut-blocks them and takes them out of the play completely. McNeal showed an impressive cut-block multiple times, which is great to see because of his lack of great size. Not only that, he even showed that he could make a cut-block to save Barkley’s skin, and then got up and released and caught a check-down from him. McNeal isn’t a great pass blocker, but he is pretty reliable given his stature. Vision: McNeal’s vision is pretty good, but I want to see more from him in this area. Now that he is likely to be the feature back all season we should get a better look at this, but at times there were great run lanes for him to run through and those were often his best runs (as you would expect) but he did show the ability to find cut back lanes and showed good enough vision for me to give him a positive grade in this area. But now that he’s the feature back we should get a much better feel for it, though he has consistently shown a patient running style and an impressive ability to use his blockers at the line of scrimmage or downfield. Carrying: This is one place where McNeal worries me a little bit, but it is correctable obviously. McNeal had a couple key fumbles last year, including one in overtime against Stanford that ultimately lost USC the game. He regularly only has one hand on the ball when contact is imminent, and the safest way to prevent fumbling is to get into the habit of covering up the ball when contact is coming. He doesn’t do that right now, and not surprisingly it has led to a couple of unfortunate fumbles. If he learns to do this (and I would imagine he will, Kiffin has benched multiple backs for fumble issues in the past two years) then it will alleviate many of my fumbling concerns. It isn’t a huge problem, but you’d hate to sully a good or great game with an untimely fumble at the end like McNeal did versus Stanford last season. Injuries: McNeal got knocked out of the game once or maybe twice because of particularly hard hits last season, but he returned each time and continued to be effective. He has proven to be pretty durable, but carrying the load as one of the only proven backs on USC’s offense for an entire season will be a lot different than emerging as the best back and having a starring role for the last 6 games. His durability will be something to keep an eye on as the season progresses because as the season wore on last year I was wondering if he lost a little bit of his impressive burst and straight-line speed. If he wears down over the course of the season USC’s rushing attack could have similar problems to the beginning of the 2011 season, when McNeal was not getting consistent carries. Character: McNeal’s emergence was delayed partially because of the coaching staff preferring Marc Tyler’s experience and partially because McNeal was academically ineligible for the 2010 season, delaying his possible emergence to 2011. He was not utilized very much prior to that, so his limited touches did not give Kiffin and the offensive staff any reason to start him over Tyler. That led to an ineffective running game before McNeal seized his chance after Tyler’s injury and eventually became the go-to guy. He has since dedicated himself to his studies and obviously was eligible last year, but it is worth noting that he had an issue with that in the past. Beyond that, I have very little insight into McNeal’s character. Overall: McNeal definitely has draftable ability, it is only a question of how high he is selected. At this point, I think he is one of the top returning senior running backs and should open even more eyes as his role is expanded during the 2012 season on a very high-octane offense thanks to Matt Barkley, Robert Woods, Marqise Lee and two very talented sophomore tight ends Randall Telfer and Xavier Grimble. McNeal won’t face a lot of defenses that dare to put more than 7 men in the box, and if they do Barkley and company should make them pay. McNeal is set to have a complete break-out season this year, though his true break-out was last season when he carried the ball 24 times for 118 yards against Notre Dame. He would finish only two games with under 100 yards after that, totaling 87 and 94 yards in those two contests. He has possible sub 4.45 speed, impressive quickness, burst and acceleration and enough vision to find cut-back lanes when defenses overpursue. Despite his lack of size, he has strong legs and uses that to run through arm tackles and to gain tough yardage after contact, even injuring a player or two because of the impressive pop he creates after contact. He has flashed the ability to catch the ball effectively out of the backfield as well as pass block despite his lack of size and bulk. He has shown that he has the tools to be a complete back despite his size and figures to be a key cog in USC’s offensive machine again this year, much like he was in the last 6-8 games last year. I think he will open a lot of eyes as the season goes on, but I am a McNeal fan and have been since I was begging Kiffin to give him more carries after I watched him play Syracuse and Arizona last year (he had 5 carries for 79 yards vs. Syracuse and 7 carries for 74 yards vs. Arizona). The next 7 games he had four 100 yard games and 6 touchdowns, with 86, 87 and 94 yards in each of the three games he didn’t exceed 100 yards. He averaged 6.93 yards per carry, among the best of the country, and proved to me that he has the ability to be a complete back at the college and potentially at the NFL level. I look forward to watching him play for a full season as the returning starter. Projection: 3rd round. It’s tough to project him much higher because he has only had significant work for less than one whole season, and his size, fumbling and durability questions will certainly warrant further consideration. But he’s a complete back than can run effectively, catch effectively, and pass block better than you would expect given his size. He has NFL caliber talent, but he isn’t going to be a 1st round pick. Thanks for reading, hopefully you have enjoyed these four initial Pre-Season Scouting reports. 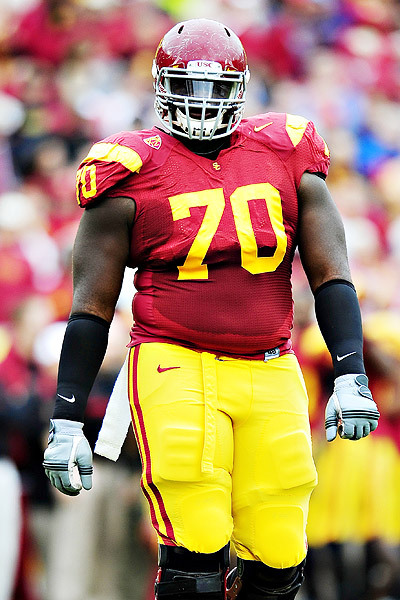 There is more to come, but first I will be posting an interview with new USC left tackle Aundrey Walker tomorrow, and a Logan Thomas Pre-Season report sometime after that. 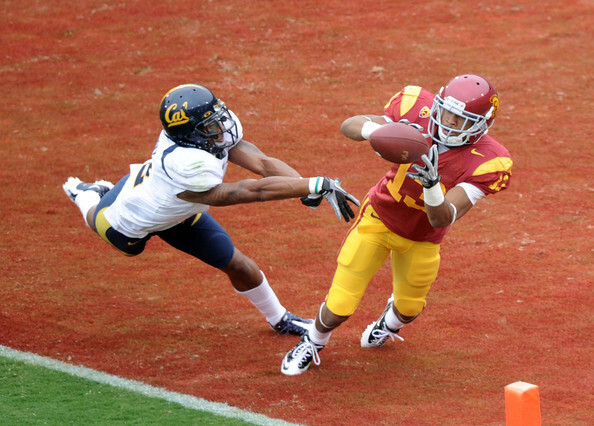 Robert Woods is going to be at the top of many WR rankings this year, and for good reason. He’s one of the most NFL ready receivers in the country. Size: Doesn’t have great size, but he is listed at 6’1”, 184 pounds. He could stand to add some weight, but he doesn’t look skinny to me on film. Adding some size and strength might help him beat more physical corners at the line, and he might struggle less with physicality from the defense in general. Speed: Woods clearly has impressive speed. I don’t think he’s a 4.4 flat guy, but I wouldn’t be surprised if he was timed in the 4.45-4.47 range. He has good burst off the ball and accelerates to his top speed quickly, allowing him to beat defenders in 1 on 1 coverage when he is given the opportunity. He’s not easy to overthrow deep, but it happens at times. Woods is also dangerous after the catch because of his speed, and because of his ability to gain yards after the catch he is used on returns as well as on offense. He often demands a safety over the top, making life easier for the other superstar wide receiver on the Trojans, Marqise Lee. Quickness: Woods has impressive quickness as well. He changes directions quickly, and his quickness is always on display when he is running his routes. His change of direction speed and his burst make him ideal for quick screens and passes in the flat where he can make a man miss and pick up additional yardage. His quickness certainly informs his route running, and he definitely does a good job getting in and out of his breaks. Release: Woods has a good release when he is allowed to get off the line of scrimmage without a challenge from the corner, but when he is engaged by a strong, physical corner he can have trouble getting off the line of scrimmage. He needs to get stronger, work on beating the jam and being physical once he is healthy, because it is one of the only things holding him back from being a truly complete, elite receiver prospect. USC moves him around constantly, playing him in the slot, in the backfield, and bringing him in motion frequently to try to help him avoid jams, but to be a top WR prospect he will need to learn how to beat the jam consistently. Route Running: Woods’ route running has been great since he was a freshman, so it’s no surprise that he continues to run very good routes. This is one of Woods’ strengths without a doubt, and it helps him create consistent separation versus man coverage. He has a good feel for zone coverage as well and knows where to sit to give Barkley a target to throw to, and usually is on the same page with Barkley when running option routes and looking for back shoulder throw opportunities. As he continues to learn more and more about reading coverages pre and post snap I think he will become very dangerous on back-shoulder throws, but he still has room for improvement there. Hands: Woods hands are very good, but when I was watching him last year he seemed to have one drop a game that he should have come down with. I’m not sure if they were concentration issues or not, but that is my best guess having watched over half of his 2011 games. He clearly has NFL caliber hands and catches the ball very cleanly outside of his frame. He rarely body catches and regularly makes impressive diving catches to bail out a less than stellar throw from Barkley. He can catch passes that are low, high, outside and he holds onto passes once he catches them even if there is contact immediately after he makes the reception. He will be able to go over the middle in the NFL, especially once he puts a little more weight on to help improve his durability. He can make the tough catches look easy, but he needs to make sure he eliminates the easy drops this upcoming season. Body Control: Woods has pretty good body control, but I’m not ready to say he is good or great in this area yet. He shows the ability to make tough adjustments to the ball in the air, but while he came close to a lot of big plays on underthrown balls or passes thrown too far inside when they should have been outside, he didn’t often come down with them. Also, there were a number of times when he had a chance for a touchdown or a big play on the sideline but he didn’t quite get his feet in-bounds, resulting in an incompletion instead of a game-changing play. He can certainly improve this, he just needs to drill it, but he isn’t there yet in this aspect. I want to see him make those game-changing plays on difficult deep balls and catches near the sideline that he didn’t quite make last season. He has the tools and the ability to do it, he just needs to keep working at it. In Traffic: Woods is a reliable receiver in traffic and because he can snag passes outside of his frame he gives Barkley a big target radius to throw to even though he isn’t much taller than 6’0”. Like Marqise Lee, he plays bigger than his actual listed size and that has something to do with his catch radius as well as his athleticism to track down poorly thrown balls with a quick adjustment on a ball thrown too far forward or too far behind or a diving catch when he is in full stride. He isn’t afraid to go over the middle and I don’t think I ever saw him make a catch in traffic and drop it as a result of contact, and there were plenty of instances where that could have happened. Once Woods catches that ball the only time it’s going to hit the ground is after he’s tackled and the ball gets placed between the hashes for another snap. YAC: This is one of Woods’ best characteristics. Woods does a great job setting up and using his blockers both as a return man and as a receiver on screens or just running after the catch in general. He has impressive vision and while it can be risky, he knows when to cut back against the grain and when to forge ahead and get the tough yards. He can be physical as well, fighting for tough yards after contact is made, but is at his best when he can make defenders miss in the open field due to his stop/start ability and his impressive acceleration. It does concern me a little bit that he tends to run out of bounds at the end of plays instead of fighting for additional yardage, but some of that may have been a result of being banged up towards the end of the season. That’s something I’ll be keeping an eye on during his junior campaign. Blocking: Woods isn’t a great blocker, but the effort is certainly there and once he gets stronger I think he will continue to improve in this area. He never got called for a hold in all of the games I watched, so that is certainly a plus, and there were a number of plays where his block downfield helped spring a big run for Curtis McNeal. He gives good effort and is certainly willing to block, plus he has some nastiness to him and really likes to blindside pursuing defenders, not unlike Hines Ward. I love to see that, and he got a couple really good licks on bigger defenders doing that as a sophomore. Overall: Woods is at the top of my list of wide receivers right up there with Keenan Allen. I’ve been a huge fan of both since I watched them play as freshman and it’s going to be difficult to pick one over the other at any point. Woods is a complete receiver that catches the ball well, runs impressive routes, is dangerous after the catch, adds value as a return man and shows good effort as a blocker. Not only that, but he is a team player. According to an ESPN broadcast, Kiffin called Woods after a tough game where he was relatively ineffective because of injury and wanted to make sure he wasn’t down on himself. Woods told Kiffin that he didn’t care how many passes he caught because the team won. That’s the kind of receiver you want to have in your locker room. Right now he just needs to get stronger, work on beating jams at the line of scrimmage, clean up some of his easier drops and work on making tough catches deep and along the sideline. Those might seem like small critiques, and that’s because for the most part they are. Woods is a NFL ready receiver and should be a popular player come April if he can overcome some of the durability concerns that have been popping up recently. An injury is the only way Woods will be consistently stopped, though he could stand to improve against more physical defensive play. I’m very high on Woods and I am excited to watch him continue to progress as a junior, and I would be very surprised if he didn’t declare after this season. Projection: Top 10. I don’t want to go much further than that, but Woods certainly has the skill set and NFL talent to go this high. I don’t think he is a franchise caliber receiver like Calvin Johnson, Randy Moss in his prime or Andre Johnson, but I think he has the potential to be a #1 wide receiver. If not, he is going to be an absolutely lethal #2. Thanks for reading! Scouting reports on Khaled Holmes and Curtis McNeal will be up soon! Barkley was once considered the favorite to be the #1 overall pick, but after extensive study I don’t see any way that will happen. Size: Barkley is listed at 6’2”, 220 pounds but that is probably a little generous. He is probably closer to 6’1” if I had to guess. While he certainly isn’t skinny, Barkley won’t be mistaken by anyone for a quarterback with elite size. Arm Strength: Barkley’s arm strength is something plenty of talent evaluators are going to disagree on. He clearly doesn’t have “elite” arm strength, and I would even hesitate to describe his arm strength as “good”. If I had to put a label on it I would call his arm strength “above-average.” He has enough arm strength to play in the NFL, but he can’t make every throw with appropriate velocity, especially on throws outside the numbers. He struggles to make throws from the opposite hash to the far sideline as his passes tend to have a little air under them, which will allow NFL caliber corners and safeties to make plays on those passes. Lane Kiffin and USC clearly realize Barkley’s arm strength is not what makes him a good or great quarterback, and use plenty of short passes, bootlegs and screens to highlight Barkley’s abilities. His arm strength translates much better on throws down the middle as his velocity is better. He can make intermediate throws 15-20 yards downfield down the middle, and can put enough velocity on 10 yard curls to complete them at the next level. He can throw the deep ball as well, though his passes have plenty of air under them. He often only connects on deep passes when he quickly reads single coverage for either Robert Woods or Marqise Lee and throws the deep ball with plenty of air under it so they can run under it. What is troubling is that even though he doesn’t have good or great arm strength he doesn’t consistently throw deep passes in stride; some will be accurate, in stride catches, but plenty are either overthrown by a couple yards or underthrown, requiring the receiver to make a difficult adjustment to catch the ball. Luckily for Barkley, Woods and Lee are two of the best in the country at making these adjustments, so his deep ball statistics may be deceiving. It was also interesting to evaluate Barkley in a collapsing pocket or with defenders bearing down on him. He doesn’t have the arm strength to make intermediate throws off of his back foot with quality velocity, and doesn’t spin the ball as cleanly off of his back foot. However, he flashes enough accuracy to make a NFL throw if the player is wide open in the intermediate range where his lack of arm strength wouldn’t be a significant problem. Barkley’s arm strength may not be elite, but he may have just enough to be a NFL starter. However, he is somewhat reliant on a clean pocket to succeed, as he doesn’t have the arm to get quality velocity without stepping into his throws. Unfortunately, his overall his arm strength will limit what his NFL offensive coordinator will be able to do schematically. Accuracy: Barkley’s accuracy is definitely one of his strengths, but I don’t think it is elite or great either. His accuracy on short and intermediate routes is consistent, but like any quarterback he has his misses. He consistently throws passes in stride and to the correct shoulder of the receiver, which allows Woods and Lee to take advantage of yards after catch opportunities. He also has pretty good accuracy when throwing off his back foot in the face of pressure. However, his ball placement isn’t elite, it just looks like it sometimes because his receivers both catch the ball so well outside of their frames. His ball placement on deep passes and fade routes leaves something to be desired. His deep passes are routinely either underthrown or overthrown, leaving his receivers attempting difficult adjustments on short throws and diving (often unsuccessfully) to get a hand on overthrows. Obviously deep passes are the most difficult to complete, but I worry about how often he will be able to complete these passes at the next level if he is struggling to complete them with two clearly NFL caliber receivers at USC. Mechanics: Barkley’s mechanics are another one of his strengths. I wouldn’t call them elite, but they are certainly very good. He has a quick, efficient release with little wasted movement that allows him to get the ball out quickly in the face of pressure. His release point isn’t elite due to his size, but he has an over the top release that projects well to the NFL. Barkley’s footwork has improved significantly since he has been at USC, and at this point I would say he has very good footwork. He flashes very impressive footwork in the pocket side-stepping the rush, climbing the pocket, and buying time without leaving the pocket. However, at times he will throw off his back foot unnecessarily, which negatively impacts his pass velocity and how cleanly he spins the ball. He has plenty of experience under center and in shotgun, and his footwork on his drop-backs are quick and clean. His mechanics are well polished, which is to be expected considering he is a 4th year senior who is returning for his 4th full year as the starting quarterback for USC. Athleticism: Barkley doesn’t have game-breaking athleticism but he is certainly athletic enough to avoid pressure in the pocket, scramble outside to buy more time, and pick up yardage if the defense takes away his passing options and there is some open field in front of him. He won’t be making highlight reel runs, but he isn’t a poor athlete by any means. Pre/Post-Snap Reads: Pre-snap reads are one of Barkley’s strengths. He has a lot of experience as a starting quarterback so he has obviously seen a lot of different blitz packages, coverages, and defensive alignments, both pre and post snap. He frequently makes adjustments at the line of scrimmage and has good enough awareness to make a quick throw when corners are playing with big cushion even if he has a run play called. Barkley’s anticipation also may be his most elite characteristic as he frequently throws receivers open by releasing the ball as they are making their breaks. He might be the best in the country when it comes to making throws with that kind of anticipation. However, despite his great anticipation, I’m not convinced that he is elite when going through his progressions and reading the defense. Too many times he throws passes against quality 1 on 1 or double coverage for me to be convinced of that. He doesn’t panic under pressure which is good, and he certainly has shown that he will scan the field from left to right and vice versa when given the opportunity to do so, but he also has a tendency to lock onto Woods or Lee at times. That allows defenders to key on those throws and make plays on the ball. So while I love his pre-snap reads and his anticipation I still have some issues with his post-snap reads due to forced throws into coverage as well as his habit of locking onto his primary receiver a little too often. And while I realize this often has to do with play design, there are way too many times Barkley locks on to a receiver in the flat or a running back on a swing pass and doesn’t even scan the field, tosses an easy throw to them, and either gets free yardage or a tackle for loss. They aren’t NFL throws, aren’t even close to NFL reads, and they don’t translate to the NFL at all. I don’t know why the play design would require him to throw to the flat as his primary read, but if that’s the play design then his offense isn’t preparing him as well for the NFL as many might assume. Decision Making: Barkley’s decision making has certainly improved a lot since his freshman year, but it still has room for improvement in my opinion. He still forces throws against good coverage when he should look elsewhere or check down too much for my liking. Not only that, at times he makes throws that he can get away with in college but in the NFL they could easily be incompletions or interceptions. Even some big downfield plays that he got were a result of his receivers bailing him out with great plays on underthrown passes. Every quarterback needs that at times, so I realize I am being a little harsh, but it is more of a pattern with Barkley than you would like from a franchise caliber quarterback and potential top 5 pick. His interceptions also dropped this year as he set a career high for touchdowns, so I realize I am getting picky here, but he is not an elite decision maker yet despite his very impressive statistics last year. Intangibles: Barkley has impressive intangibles without a doubt. He was named a captain of USC’s football team as a sophomore, the first time that has ever happened as far as I know, and he was USC’s starting quarterback as a freshman, another first for the prestigious program. He is clearly the leader of the team and he showed a lot of leadership by coming back for his senior year to try to lead his team to a BCS Bowl Game and potentially a National Championship. He has also matured enough to not let interceptions noticeably rattle him, and he has shown that he can bounce back from turnovers and still make good throws. Additionally, there may not be a quarterback in the country who does a better job keeping defenses off balance with his cadence before the snap. Without fail Barkley gets defenders to either jump offsides or jump and recover, multiple times a game. That is a sign of his veteran experience as well as his football IQ. However, I don’t think Barkley is a “franchise” quarterback. I don’t think he elevates the play of the players around him, I think his performance has a lot to do with the talent around him. While he has improved both as a leader and as a player over the past three years, the caliber of players around him on offense was very impressive this year (save for a couple spots on the offensive line) and he had his best season. I’m not implying he is simply a product of his supporting cast, but it certainly has an impact. Barkley also has a pretty impressive football IQ, though I’m not ready to call it elite due to some of the issues I have mentioned previously. Character: Barkley is a very good football player as well as a very good person, and is well known for his charity work off the field. He’s an easy kid to root for on the field and off of it, and you love to see that. Overall: I have been a Matt Barkley fan since he walked onto campus at USC and began competing for the starting job. He may not have elite size or arm strength, but he’s a quality player and a quality person. Unfortunately, I don’t love him as much as a NFL prospect as I had previously expected, and I don’t see any way he will end up being the #1 overall pick come next April. Even with a terrific senior season he won’t improve his stock significantly unless he shows improved decision making, better accuracy on deep passes, and better production when throwing from a collapsing pocket and off of his back foot when under pressure. That may not sound fair, but NFL teams don’t make draft picks based on fairness. He is a very polished player, which is certainly a positive, but the downside is he doesn’t have a lot of mystery to his game and what you see is more than likely what you are going to get at the next level, even if he continues to improve a bit as a senior. His arm strength isn’t going to go from above-average to great between now and the draft, his accuracy isn’t likely to go from good to elite by April, and he probably won’t grow a couple inches to alleviate concerns about his height in the next 10 months. He’s a good college quarterback, but I don’t think he will ever be much more than a solid NFL starter due to his arm strength limitations. His accuracy and anticipation will give him a chance to start at the next level, but he is not a franchise quarterback and should not be a top 5 or 10 pick in my opinion. Projection: Late 1st, Early 2nd. It doesn’t feel right to put him this low, but right now I can’t say he’s a top 10 pick. I just don’t think he has the raw talent to be a great NFL starter, and may have a similar career arc to Mark Sanchez. He has a better football IQ, and I don’t think players will have issues following him like some of his teammates seem to be having with Sanchez, but I think he will need a strong run game and defense to go deep into the playoffs much like Sanchez has. Thanks for reading! I’ll have scouting reports up on Robert Woods, Khaled Holmes and Curtis McNeal shortly.